A Freedom of Information Act (FOIA) request submitted by Steven Aftergood, director of the Federation of American Scientists’ Project on Government Secrecy, was answered January 16th in the form of a document listing 38 research papers produced under the Defense Intelligence Agency's (DIA) Advanced Aerospace Threat and Identification Program (AATIP). The list provides few details, but does give a tantalizing look into the kinds of things in which the program was interested. The list of papers includes titles like Pulsed High-Power Microwave Technology; Traversable Wormholes, Stargates, and Negative Energy; Invisibility Cloaking; and Warp Drive, Dark Energy, and the Manipulation of Extra Dimensions. The AATIP was first introduced to the public in 2017, when it was revealed the Pentagon had funded the $22 million project, which was officially active as recently as 2012. The program, parts of which remain classified, was sponsored by then Senate majority leader Harry Reid (D-NV) in 2007, who has a strong interest in UFO phenomena. The AATIP was created to collect and analyze data from a wide range of "'anomalous aerospace threats"; from advanced aircraft operated by adversaries of the U.S. to commercial drones to extraterrestrial encounters. Most of the money used for the program went to an aerospace research company ran by Robert Bigelow, a billionaire entrepreneur and longtime friend of Reid, who himself said in an interview with 60 Minutes last May that he is "absolutely convinced" of the reality of the UFO phenomenon and that mankind has been visited by extraterrestrials. 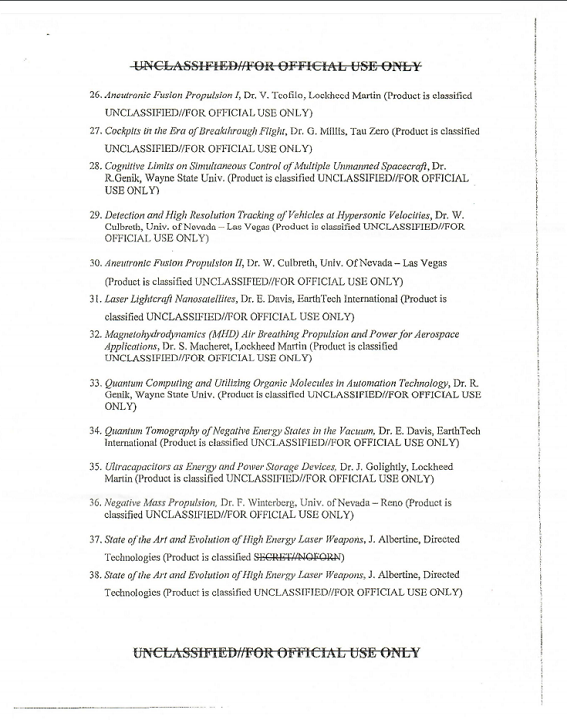 The money was reportedly used by Bigelow's company, Bigelow Aerospace, to modify buildings held in Las Vegas for the storage of metal alloys and other materials that were said to have been recovered from unidentified aerial phenomena. Research was also reportedly done on people who claimed to have had experienced physical side effects as a result of exposure to said materials. 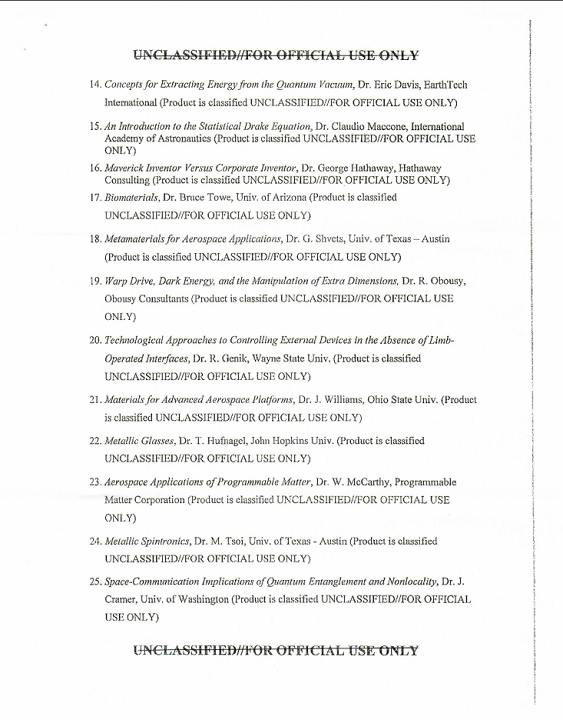 The results of Bigelow’s research or any of the listed research papers are currently unknown, although Luis Elizondo, former Department of Defense (DoD) intelligence officer and program head for the secret Pentagon UFO project, hinted at upcoming disclosure in an interview with George Knapp on December 14th, 2018.